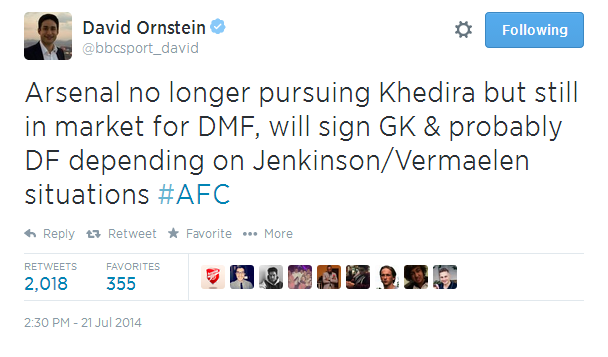 Khedira to Arsenal is nearly OFF according to reports and David Ornstein tweet. But Wenger is still looking for a defensive midfielder. When Arsenal gave a statement by splashing the cash for Chilean Alexis Sanchez, many were expecting it would be their last marquee signing as indicated by the previous transfer window including Mesut Ozil. But with two World Cup winners already in their ranks with Mertesacker at the heart of their defense and Ozil, Arsenal were keen on adding another to their ranks to bolster their midfield options. “It’s not over, there’s still a long way to go”, Arsene Wenger on summer transfer plans after signing Debuchy and Sanchez. After missing a large part of last season due to injury, German international Khedira was on Arsene Wenger shortlist as the World Cup reached its climax. After scoring an impressive goal followed by an assist, Khedira was strengthening Arsenal’s claim of breaking the bank once again as Michael Arteta position in the Arsenal starting lineup is in danger due to age factor. Khedira just made 12 starts for Real Madrid last season due to injury. Khedira was also on Chelsea’s shortlist for some-time however after capturing the signature of Spanish international Cesc Fabregas and with a flood of midfielders already in their ranks, it became clear that Jose Mourinho pulled out of the race soon after it started. So for quite a considerable amount of time, Arsenal were the front runners in the race to capture the German. Khedira who has a year left on to his contract looks to be in no hurry to sort out his future now. And with Arsenal the only team according to news after him, recent reports suggest that wages were a huge concern for Arsenal as Khedira wage demands were more than that of Ozil and Sanchez, the current Arsenal top earners. And now with top BBC journalist suggesting Arsenal are out of the race, it is said that the gunners are now in for William Carvalho.